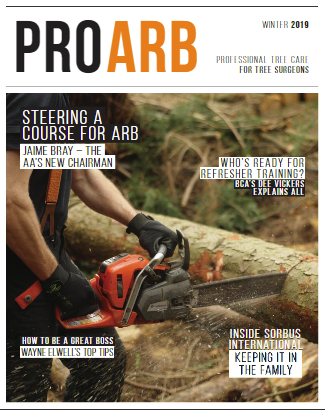 Each month Pro Arb’s apprenticeship feature showcases a young person starting out in the arboriculture industry. This month, we meet Matthew Laine. What is your role within Conservation Contractors Ltd? I’m the apprentice arborist here. My previous jobs included working on tug boats in Portsmouth and spending time on a tall ship for six months. I then moved to Wiltshire where I was land locked, and I realised I wanted a job outside in the elements that was as challenging as boating. Arboriculture seemed my best bet. Did you go to college? If so, where and what qualifications did you get? What is your favourite part of your current role? My favourite part has to be driving all the different vehicles and being able to climb. The climbing brings back my sailing days going up the mast. The worst part is when I have to drag brash around awkward gardens. I also don’t like having to wear chainsaw protective trousers in the heat – although I know I have to! I arrive at the yard at about 8am, load the truck up with the gear, and head off to that day’s job. The climber will lower branches down once they’ve been cut and I’ll drag the brash to the chipper and load it all in. Once the job is finished to a high standard, I use a backpack blower to clean up all the sawdust and leaves and head back to the yard to unload the truck before heading off home. What is your favourite piece of equipment to use? My favourite piece of equipment is the 26m mobile elevated work platform we have. In terms of completion of your training, when do you expect to become a fully qualified arborist? Once I have passed my Using a Chainsaw from a Rope and Harness ticket, but I won’t be up to industry standard for another three years. How important would you say colleague interaction and learning from those you work with is in your path to becoming a qualified arborist? It is very important. I need to learn from the rest of the team as they have more knowledge of the trade than I do. They also have plenty of horror stories that ensure you remember to be safe while doing the work. Things they mention help you to add to your own experience – like when they talk about positioning in a tree while climbing. Arboriculture is hard on the body, and the easier you can make it, the longer you will be able to stay in the trade. Is there a structured development plan for you at Conservation Contractors? There’s a programme for all the staff, which I hope will serve me well in the future. Do you have a designated mentor at your workplace? The whole of the arb team are my mentors! What are your future ambitions within the industry? My ambitions are to become a qualified climber, then hopefully team leader.